Gintong Kasaysayan, Gintong Pamana (A Glorious History, A Golden Legacy) is a colorful mural in Unidad Park depicting Filipino American history and culture. With the designation of Historic Filipinotown (population 18,000), all five Asian Pacific Islander ethnic neighborhoods in Los Angeles, California, have become Preserve America Communities. In the early 20th century, Filipinos settled in the downtown areas now known as Little Tokyo and Bunker Hill. Post-WWII redevelopment displacement shifted the Filipino-American community to this area along the Temple-Beverly Corridor northwest of Downtown. Historic Filipinotown was designated by the city of Los Angeles as a historic-cultural neighborhood in 2002 after a 30-year campaign. 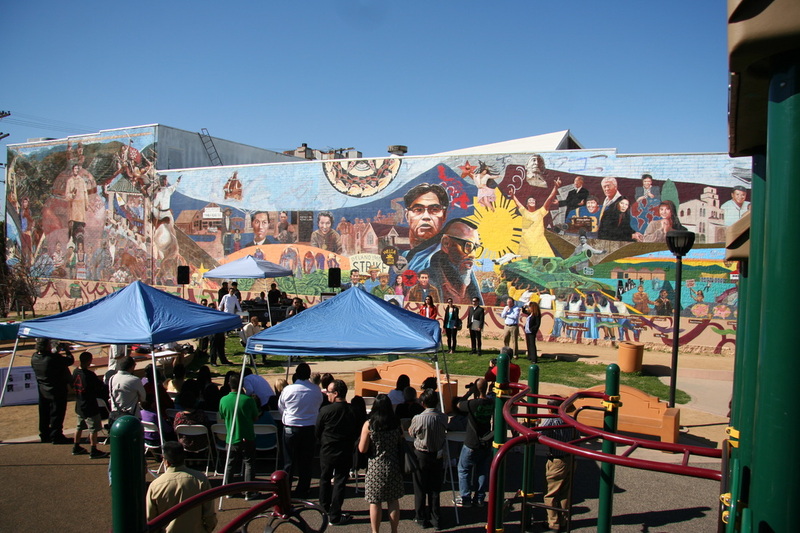 Civic and business groups continue to work closely with the city to preserve the neighborhood’s ethnic heritage assets and to utilize its unique character to promote cultural heritage tourism, economic development, and community revitalization. Today, Historic Filipinotown reflects the polyglot nature of Los Angeles. While the district still has a sizeable Filipino population and continues to serve as the region’s historic, social, and cultural center for the community, it shares the area with a majority population of Mexican and Central Americans, as well as African Americans, Armenians, and other Asians. The city of Los Angeles has designated seven sites within the neighborhood as Historic Cultural Monuments and a survey in the coming year will research other potential monuments. One of these is Occidental Studios, among the oldest continually operating film studios, where actress Mary Pickford and pioneering filmmakers Cecil B. DeMille and D.W. Griffith all worked. Two local places key to telling the community’s story are a mural depicting Filipino American history and culture, entitled Gintong Kasaysayan, Gintong Pamana (A Glorious History, A Golden Legacy) and the only Filipino American World War II Veterans Memorial in the country. Many local organizations encourage community stewardship, including the Search to Involve Pilipino Americans (SIPA), which mobilizes volunteers to care for these local treasures. The Filipino American Library, the first and largest in the country, also leads bus tours of the community’s historic sites and cultural monuments. Numerous other community groups meet monthly at SIPA to coordinate their efforts. The Pilipino Workers Center (PWC) launched Mobile HiFi tours in 2009 to give the public a better understanding of the neighborhood’s character, significance, and rich cultural history. Participants can take walking tours guided by interactive mobile devices and long-time residents, or unique “Jeepney” tours riding in a Sareo Motors conversion of a 1944 Willys Jeep. Mobile Immigrants’ Guides, available online, feature stories of residents and immigrants from 1898 to the present, oral histories, traditional music, historic photos, and profiles of local establishments. The guides were developed in conjunction with PWC’s youth media program, PDUB PRODUCTIONS. An annual Historic Filipinotown Festival includes foods, craft and educational activities, a 5K run and two days of cultural entertainment reflecting the diversity of the community. Each December, the Historic Filipinotown Parol Festival and Parade caps a week of learning about and making these traditional, star-shaped, paper-mache lanterns. These events draw thousands of visitors to the neighborhood. An interesting 2005 streetscape project, a collaboration between the city council and the Historic Filipinotown Improvement Association, included painting crosswalks with decorative designs drawn from traditional ethnic patterns and the installation of medallions and banners identifying the neighborhood on major thoroughfares.